You've got it!!! Just make sure the your labels #1 and #2 are connected to the feedback pin (3) of the small chip. Believe this is so, because it would need to be to have the original circuit board work as advertised. You aren't the first to have difficultly grasping the current mode concepts, most folks think in voltage mode since it's usually the "forcing function"; Batteries, light bulbs, appliances, AC power, and so on are all voltage rated. The easiest way to think of this circuit is to imagine that the original circuit implements a kind of "Op Amp" with two inputs and a single output. 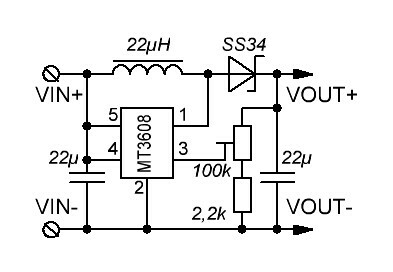 The OP Amp has very high internal gain and produces an output voltage that is this gain times the voltage difference at the inputs. As the circuit board comes (assume VOUT- is ground or "0" volts), the chip includes most of the circuitry and has a 0.6 volt reference connected to the + input of the Op Amp which isn't available for outside the chip connection. However the - input to the Op Amp is available and this is the feedback (pin 3 on the chip). Thus the circuitry outside the chip must produce a voltage at the - input (pin 3) such that the Op Amp output voltage VOUT+ is the difference times the internal chip gain, or [(+input) - (-input)]*Gain. Where Vref is the 0.6 volt internally chip connection to the Op Amp + input, and H is the feedback factor provided by the circuit board potentiometer (evidently wired as a variable resistor since the wiper and one end are shorted by the circuit board, your labeled #1 & #2) and the 2.2K ohm resistor. H = 2.2K/(Rvariable + 2.2K), so always less than 1.
and VOUT+ = Vref*[(Rvariable + 2.2K)/2.2K]. Thus with Rvariable equal to 50K and Vref equal to 0.6 volts you get 14.2 volts at VOUT+. This is classic voltage mode operation and feedback. Now we alter the circuit and connect Rvariable to the top of a current sensing resistor (your 5 ohms), which is connected to ground. The LED is connected between the current sensing resistor and VOUT+. So with high Gain the circuit will control VOUT+ to make the voltage at the end of Rvariable become the controlled variable and because this voltage is simply Iled*Rsense, it controls the LED current. So we rearrange the above equation to reflect the change (including the 200 ohm resistor instead of the 2.2K) as such. Another way to think of these "Op Amp" like circuits is to realize that both the + and - inputs must be the at the ~ same voltage for linear operation, this is a consequence of the high internal gain. Then, you can work backwards to find the other parameters. This particular circuit board is based upon a Switchmode Converter, which makes the detailed analysis quite a bit more complicated involving discrete and continuous time and frequency domain stability analysis and well beyond the scope of this thread. However, for an understanding of the intended operation, the "Op Amp" analogy is useful I believe. Hope this helps understand the current mode operation. Posted: Wed Dec 27, 2017 8:58 pm Post subject: Too bright????? First I made the circuit just as described before, but without the capacitor. I did note that I was wrong, the pot goes 0 to 1130 ohms. Then I made it just like described before but with Vout- grounded and a 600 ohm resistor (with the 2.2k resistor still there) and no capacitors. It worked, but backwards. 1 on the dial being bright, and 0 on the dial being dim. Then I switched the shorted terminals on the pot. I checked that it was running correctly with the same values but 0 ohms at 1 on the dial and maximum ohms on 0 for the dial. It burned up. No idea why it worked with the pot one way and not the other I did note the pot now reads 0 ohms when turned off. so I put it back like it was. Made the circuit again. This time I put the capacitors on, grounded Vout- again, left the 2.2k resistor in place and used a 300 ohm resistor in parallel with it. It worked! Still in reverse though. I measured voltage across the 5 ohm resistor 2.4 volts maximum, 0.6 volts minimum. That worked out to 0.12-0.48 amperes. Light seemed bright so I put it all together. It is amazing for phase contrast and dark field. With my 4x and 10x objectives though it is too bright to use on the bottom of the scale with bright field! No idea what I am going to do about that, maybe install a filter? Other than the fact it currently runs backward and is too bright to use on bright field it seems amazing. I mostly photograph with this thing anyways, so losing the ability to use bright field isn't that bad. I will try to rewire the pot later and see if I can get the direction to work right. Left it running for a bit more than an hour on high, turned it off and on a bunch of times. So far this is way better than advertised. It is too bright to use on bright field, yet runs way cooler than it did with the original bulb. Still haven't tried messing with the potentiometer again to get it to increase rather than decrease in power with the dial. I have two more good boards so I will probably do so soon. The 5 ohm resistor I used is about 100 times too high in current rating. Put a camera on it. 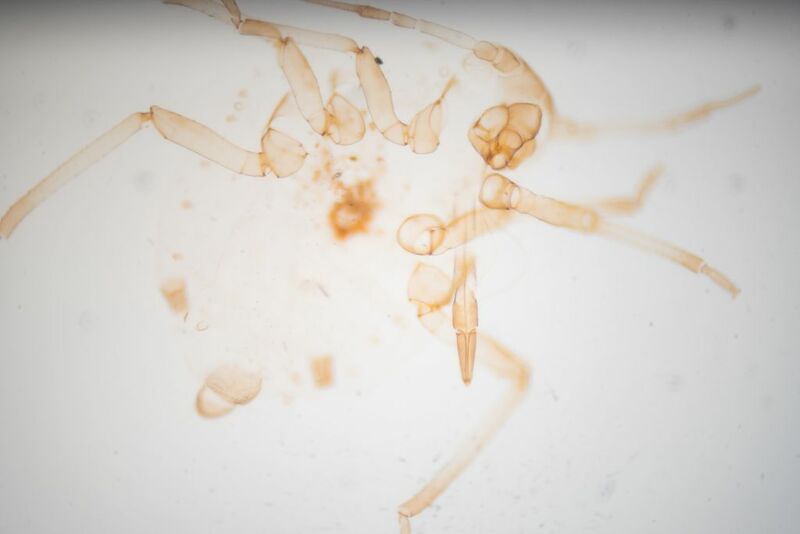 Previously I typically used 1/8 sec shutter speeds on phase contrast with my 10x objective. Now I can use 1/80 second shutter times! Not all of this was the upgrade. I found, removed (and promptly lost) a filter in the microscope as a part of this process. Still, this is a lot more light! It is running so cool I have some temptation to add a parallel resistor to the 300 ohm resistor and increase the output. It is hard to see more light helping me though. Unfortunately banding on silent shutter is unacceptably high. Hopefully a larger capacitor fixes it. I'm wondering if those boards burn out when they don't get feedback that keeps their output in specified range. In the original board, that would never happen. But in your modified setup, any broken connection to the LED or the pot will leave the feedback pin pulled down to 0V. It's a failure mode to consider, anyway. 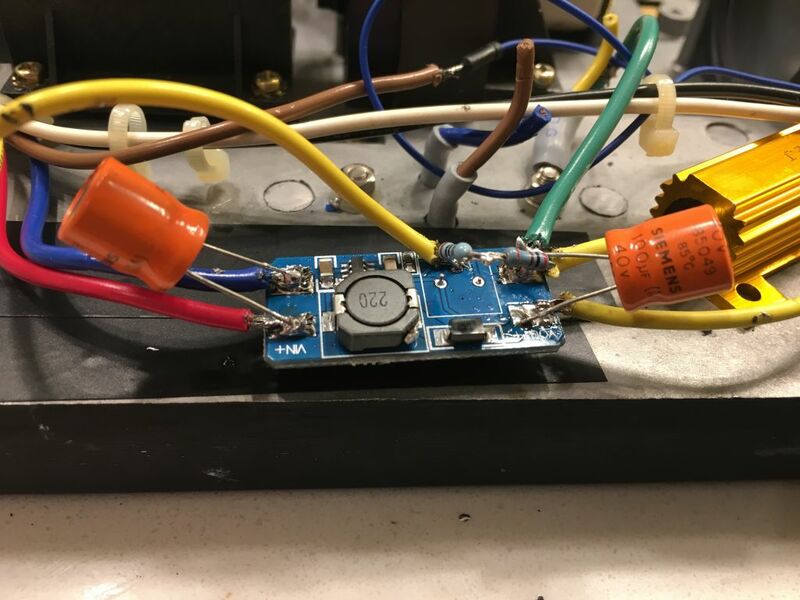 About the "too bright to use on the bottom of the scale with bright field", you might consider adding a range switch that would swap out the 5 ohm resistor for a 30 ohm, to give you another range with 6X lower current. Again be careful to not break the connection to the LED while switching, so either use a make-before-break switch, or always leave the 30 ohm connected and just switch a lower resistance in parallel with it for high range. Interesting point. Given my poor soldering skills I could easily see that being the problem with multiple boards. I may try using a 7.5 or 10 ohm resistor. I have a second 5 ohm resistor laying around. If I am understanding correctly that should reduce the lower end of the light range at the expense of higher losses. Since a half ampere seems more than enough for the top range and it runs very cool that may make a lot of sense. To get an idea how much light a half ampere gives, the maximum shutter speed on my camera is 1/4000 second. Here is an unedited photo using bright field on a 10X 0.25NA lens with a 1/4000 shutter speed. The odd color goes away easily in Lightroom. Here is the same photo using the white balance selector on the background and a bit of dehaze. Obviously this is a cheap objective with low magnification and an ugly subject, but it makes the point. That is a lot of light. Not going to see much vibration with 1/4000 shutter speeds! Electrolytic capacitors don't work at 1.2MHz, which is the switching frequence of this thing. At that frequency they look more like inductors than capacitors. I don't know what components are on the board, but it needs ceramic capacitors. You would filter mains ripple on the input side (that'll be 120Hz) with electrolytics, but you'd need more than tiddlers - what's there already? On the output side, I suggest you remove the electrolytic cap. Is there a drawing anywhere of what's on these boards? That would probably help determine why they're melting! Also too as well - it's possible the pot you have in the scope already isn't a linear type, but a "log" type. That would be so you didn't get all the useful control at one end of the rotation. If you use it other than the way intended in the original circuit, it could give you an unwanted behaviour. If it's a noisy (wire-wound?) pot, the wiper connection could go intermittent while you're turning it, which is why the other end was shorted to the wiper, so pay attention to that. It limits the maximum resistance value to 1300R. Posted: Thu Dec 28, 2017 6:21 am Post subject: Re: Too bright????? Looks like you have things generally working! With 1130 ohms as variable R and 600 in parallel with 2.2K you should get a maximum LED current of ~0.408 amps, with a 300 in parallel you should see ~ 0.633 amps. Reversing the shorted wiper ends on the pot should reverse the control direction of the pot wired as variable resistor, now 0 being on the opposite end. Increasing the sense resistor to 10 ohms will decrease the LED current range by 1/2 compared to the 5 ohms and minimum will be 0.06 amps, 7.5 with be 3/4 reduction with minimum of 0.08 amps. You can reduce LED current range (light output) as Rik mentioned, or by manipulating the feedback ratio (changing the effective value of the shunt resistance as you have shown with the 300 and 600 ohm resistors in parallel with the on board 2.2K resistor), or a Pau suggested by attenuating the LED light output. All methods should work. Chris mentioned putting the electrolytics on the 60 Hz input side (frequency doubled to 120Hz because of full wave rectification), this is a good idea. 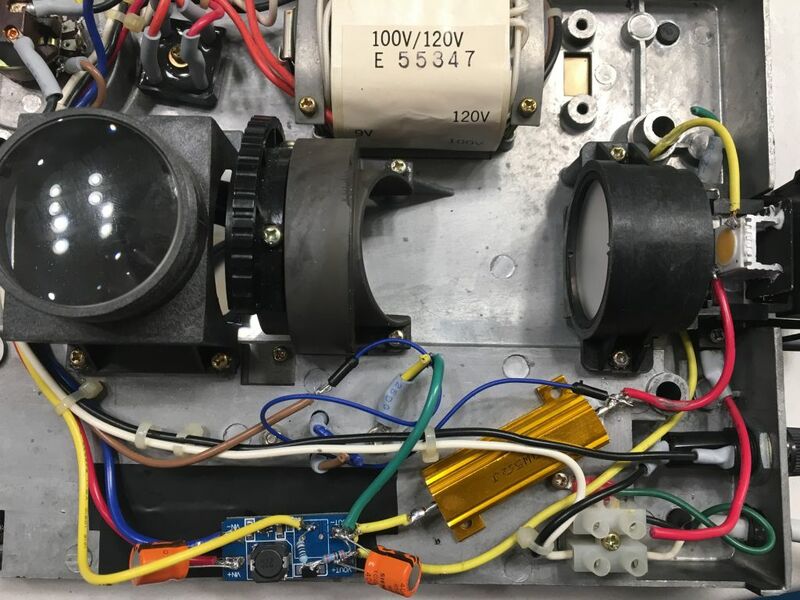 The circuit will attempt to keep the LED current constant, but the input voltage will be following a 120Hz ripple with highly varying amplitude, this may actually fall out of regulation during the ripple minimums. When this happens the LED current will be "modulated" at 120Hz and the light output will also be modulated.The input filter caps will help create a somewhat average input voltage and reduce the ripple. Yes, this is a potential risk for all negative feedback systems, voltage or current. When the feedback goes to 0 the "loop" trying to force to output to produce the proper level at the negative input terminal. Well designed systems don't allow this to destroy the circuit though, as other means prevent destruction such as output over voltage or current protection. These cheap boards apparently don't have any of that! 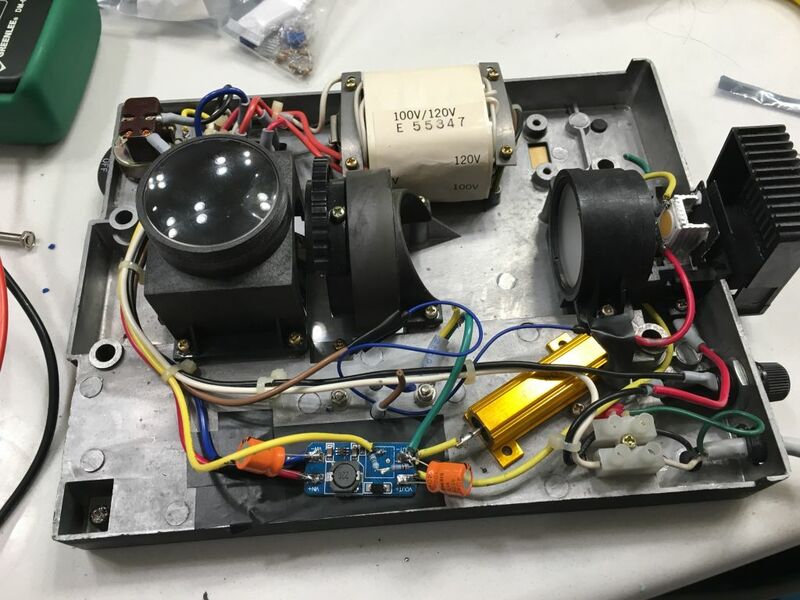 Originally, the boards were being burned up because the on board pot was wired as a variable resistor on the board and when "glmory" was attempting to wire the control pot externally the effective input to the negative feedback (pin 6 on the chip) was pulled to ground. This caused the circuit to produce an output over voltage and possibly over current condition, thus frying the board(s). The range idea by just keeping the larger value sense resistor in circuit always and switching the smaller resistor in parallel should work fine without worrying about "opening" the loop feedback switching. Look at my first schematic post (see below), the top is the board schematic I got off the net, same as your 2nd reference. However, these schematics are not correct as they show a potentiometer and one end is not shorted to the wiper as the actual board being used is. Also note the boards evidently do not have the 22uF capacitors, as these would be much bigger than the chip level caps on the boards ends. 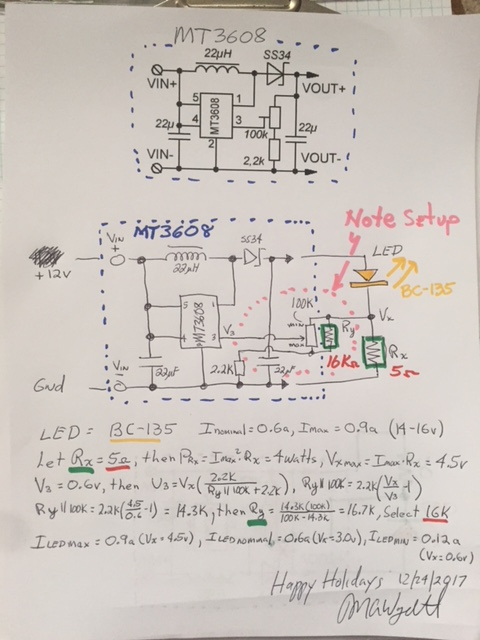 I've attached a schematic that uses the MT3608 as an LED "CURRENT MODE" controller. This requires just 2 resistors, one a current sense resistor (Rx) and another to scale the feedback potentiometer resistance to control the maximum allowed LED current (Ry). The example shows the MT3608 with a BC-135 LED, a 5ohm 4watt resistor for Rx (can be a couple 10ohm 2watt resistors in parallel), and a 16Kohm resistor for Ry. Maximum LED current is limited to specification of 0.9amps, and minimum LED current is 0.12amps, with nominal at 0.6amps. It should also work much better than the typical voltage control mode use with significantly less sensitivity to control parameters, components and LED characteristics, since LEDs are fundamentally diodes and thus current mode devices. The exponential relationship between applied voltage and current, and highly temperature dependency, makes voltage control difficult and very sensitive. Hopefully some folks will try this circuit and provide some feedback. The input cap for ripple attenuation seemed a necessity as at the low brightness end of the pot setting I could clearly see flicker, and the cap fixed this. I agree that an electrolytic at the output probably isn't doing too much good. Also, the MT3608 board that I used from AliExpress for $0.54 per board matches the picture Rik references in his post, so they are all most likely built from the same schematic.